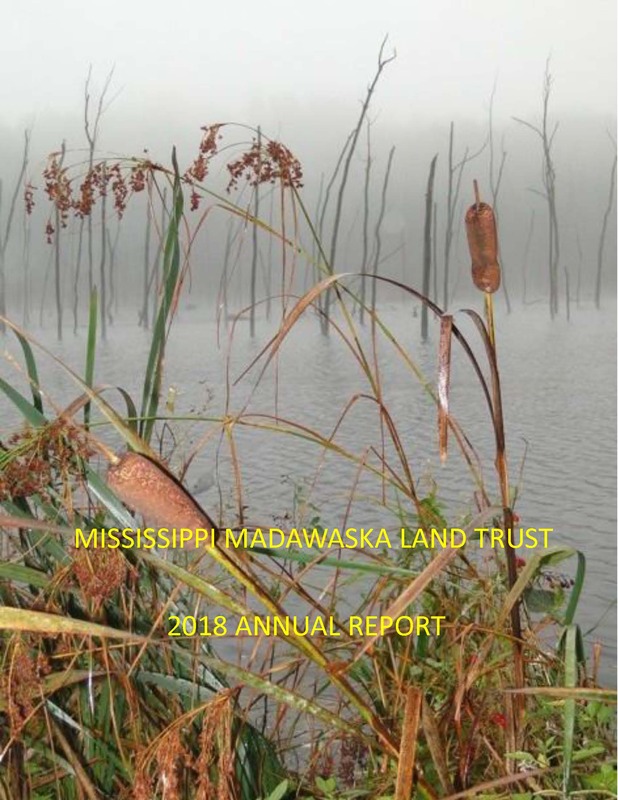 People closely associated with MMLT may have the ability (or may be perceived to have the ability) to influence decisions of the Mississippi Madawaska Land Trust Conservancy (MMLT), or to have access to information not available to the general public. As a general principle, MMLT recognizes that conflicts between the interest of MMLT and the interests of those people can arise in the normal course of MMLT’s business. MMLT recognizes that such a conflict has the potential to harm MMLT or its reputation. However, if a transaction involving such a conflict furthers MMLT’s mission and does not or will not harm the integrity, credibility or reputation of MMLT or its supporters, it can proceed subject to the review and agreement of the MMLT Board of Directors. One of MMLT’s greatest assets is its reputation. Adherence to this Conflicts of Interest policy will help ensure that MMLT will maintain the highest levels of integrity and credibility, and therefore the trust of its donors, the communities in which MMLT secures land, and the organizations including the governments with which MMLT deals. This policy is applicable to all board members, staff members, and designated contractors and volunteers and potentially donors and close members of their respective families – typically taken to mean spouse, common-law spouse, parent, siblings, children and any other relative residing within the same household (all referred to in this policy as “Insiders”). Wherever the possibility of a conflict or perceived conflict exists between the interests of MMLT and the interests of an Insider in connection with a transaction which MMLT wishes to enter into, MMLT will carefully consider the circumstances and where it is determined such a conflict is likely to harm the integrity, credibility or reputation of MMLT, MMLT will not proceed with the transaction. All board members, staff and identified contractors will sign off that they have read, understood and commit to follow this Conflict of Interest Policy. All staff will sign off when joining MMLT that they have read and understand this policy, and that any existing potential conflict of interest has been declared. Where deemed appropriate by the Board, contracts with contractors will include a requirement to disclose potential conflicts of interest. This Conflict of Interest Policy will be posted on MMLT’s public website. MMLT wants to avoid even the appearance of conflicts of interest. If there is any possibility that a conflict of interest exists between board members and MMLT, or that an action could give rise to the appearance of a conflict of interest, it must be escalated and approved by the board before any commitment is made. Any possible conflicts of interest involving staff members and MMLT must be escalated to the board. Before MMLT enters into any contract with an Insider, the Board of Directors must consider the potential conflict and must formally resolve that a more advantageous arrangement could not have been obtained with reasonable effort under the circumstances. All potential conflicts of interest must be considered by the Board and a record (Conflict of Interest log) maintained by the Secretary of the Board) kept of all decisions. Any transactions which lead to an on-going conflict of interest must be reviewed by the Board at least annually to ensure they are still appropriate. The Conflict of Interest log must be formally tabled for review by the Board annually. If an Insider is doing business with MMLT, directly or through a company or other organization in which he or she has an interest, or of which he or she is an officer or director, there is a potential conflict of interest between that person and MMLT. The same applies if he or she (or the company or organization) even proposes to do business with MMLTC. By “doing business” we mean entering into a transaction that would benefit the person (or close members of his or her family) financially, whether directly or indirectly through his or her company or organization. If an MMLT staff member is negotiating with a supplier for a large contract, there would be a conflict of interest if an inappropriate gift were accepted by the staff member (such as an expensive dinner or tickets to an expensive sports event), or favour granted to the staff member (such as offering a summer job to the staff member’s teenaged child). If MMLT is entering into an arrangement to buy or sell land with an Insider, see below. It is not always clear that a conflict exists, and if there is any doubt, the issue should be treated as if it were a conflict of interest. Because of the importance and delicacy of the question, the person who is in doubt should speak to the President of MMLT who will either decide whether there is a conflict or potential conflict, or escalate further, depending on the circumstance. Conflicts or potential conflicts involving the President and related Insiders must be brought to the Board Secretary and will be reviewed by the Board of Directors. Obviously not. It may, for example, be a significant advantage to have a member of MMLT’s law firm on the Board. The sale of a piece of land by a director to MMLT may be not only advantageous to MMLT but important for the region. The point is not to prevent conflicts but to manage them. Where there is a conflict, whether disclosed or not, the Insider must not take any step that would influence any decision or action relating to the subject matter of the conflict. This is fundamental. If the Conflict of Interest concerns a director, s/he must recuse her / himself from all discussion relating to the decision. Any transactions or other situations where there is a conflict of interest between an Insider and MMLT that could cause harm to MMLT are prohibited. Additionally, any situation where it may be perceived that a conflict could cause harm to MMLT or its reputation is also prohibited. The decision whether or not such harm occurs will be made by the Board of Directors, even where it involves a member of the Board or a Board Committee who is not a member of the Board of Directors. A conflict or potential conflict will always require the approval of the Board of Directors or its delegate before MMLT enters into the transaction. Sales or leases to MMLT of real estate by an Insider, or a company or other organization in which he or she has an interest, or of which he or she is an officer or director, are particularly sensitive, as are sales or leases of real estate by MMLT to such persons, or the granting of conservation easements by them to MMLT. Not only will all of these transactions be subject to approval of the Board of Directors, in all cases, expressed by formal resolution, but a knowledgeable independent third party, fully informed of all pertinent details of the transaction (including the appraisal), must state in writing that in his or her opinion no prejudice will be caused to MMLT as a result of the transaction. The same rule will apply to donations of real estate to MMLT. Supervisors or managers who have staff reporting to them with whom they are related or romantically involved are in a conflict of interest. It is understood that MMLT Insiders may also be involved with other charities or community organizations. MMLT cannot justifiably require them to refrain from assisting in raising funds or providing assistance for such groups. Where, however, a Director, staff member or contractor subject to this policy is aware of the possibility or possible appearance of a conflict between MMLT and an Insider’s efforts on behalf of another such group, he or she should follow the procedure above for reporting potential Conflict of Interest. Each case of harm or potential harm will be determined by the Board of Directors. However, any willful violation of this policy should be expected to result in a termination of board membership, or a termination of employment or other contract.